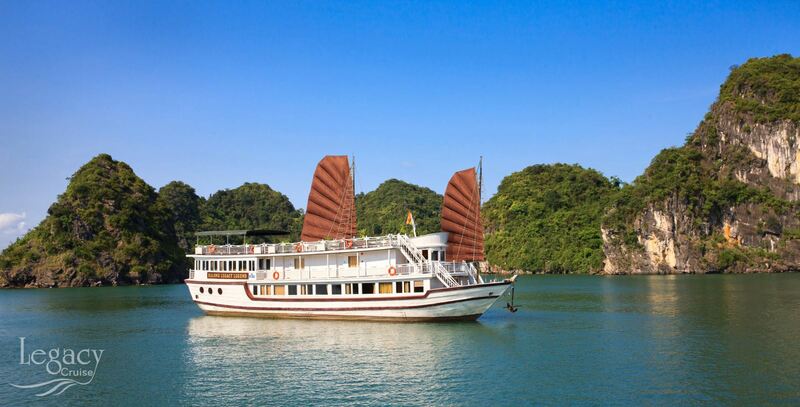 Set sail aboard the Halong Imperial Cruise, a traditional wooden sail boat, which travels along Halong Bay in the Gulf of Tonkin. Stay in a cabin room with private bathroom and all-inclusive meals. Each air-conditioned and non-smoking room is equipped with a safe. Private bathroom includes a shower, bathrobes and hairdryer. Mineral water and life vests are provided in the rooms. Relax with a massage or go kayaking, swimming or squid fishing. Witness the 2,000 islands, islets and limestone formations as the cruise passes through Halong Bay. 15:30 Exploring Hoa Cuong cave. Staying at the hotel (first night in Halong bay - 4* standard) - Tour cost is not changed. (hotel expense will be covered by the organizing company). Back to Hanoi on the first day - Tour cost is charged as one of Halong bay one day trip. What do you think of Imperial Legend Cruise ( 2 Days - 1 Night )?